Now that I had a new plan, it was time to make that a reality. 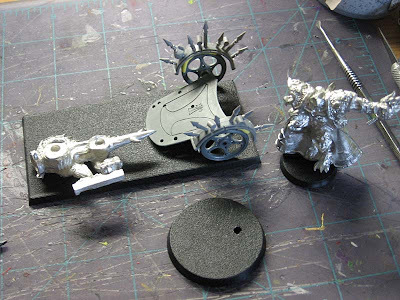 Scaling the Skulltaker's base down to 25mm made it possible to set him inside the original chariot floorboard and inside the 40mm round base as well. This allowed me to fit the entire chariot assembly inside an extended 60mm base as well. On top of that, scaling the chariot down made the Flesh Hounds look bigger in relation which was a definite plus. Here's how the base itself was constructed. 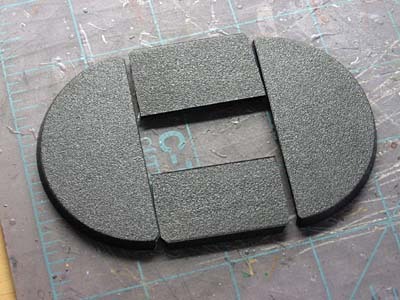 After cutting the 60mm round base in half for the ends, I cut the square chariot base in half as well. I only used as much as needed to extend the round base so that I had enough for the entire assembly to sit comfortably. I didn't want this thing to get so big that it wasn't practical on the tabletop. 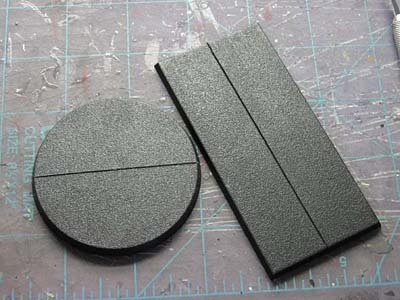 That was an interesting way to solve your basing problem. Looking forward to seeing the finished article. Elazar: This is the boring stuff I suppose... I figured I would post it anyways for those who've never seen this type of base done before. I know people are waiting for the final pics of this monster. 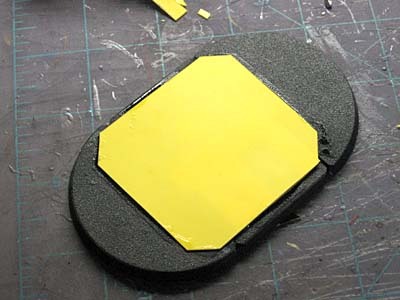 Simple & effective work on the enlarged base. This is gonna be one heckuva monster.